Launched less than 18 months ago, the Sindicato Cigar Group had a lot of things a start-up cigar brand could only dream of. In addition to industry veteran Jim Colucci as CEO, the company had the backing of of a handful of the best-known cigar shops in the country right from the outset. Sindicato has been busy in its first year launching three lines: Affinity, Hex, and their “premium bundle” Cassa Bella. 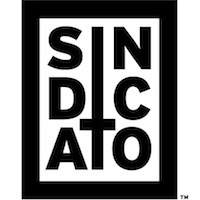 Now the company is following up with its eponymous lines: Sindicato and (coming this fall) Sindicato Maduro. I received two samples of the Sindicato blend when it began shipping to stores in early May. I smoked the Corona Gorda (5.5 x 48), one of six box-pressed sizes (MSRP $10.95). The Nicaraguan puro blend uses a shade-grown Corojo wrapper grown in Jalapa, dual binders from Estelí, and a combination of Jalapa and Estelí filler tobaccos. The wrapper is slightly mottled and reddish-brown in color. Sindicato features classic woody spice that fans of Casa Fernandez will recognize; it’s a quintessentially Nicaraguan profile. In addition, I picked up flavors of roasted nuts, black coffee, and some graham cracker towards the second half. It starts out very full-bodied but eases back towards medium in the second half when a little creaminess reveals itself. Construction was excellent throughout. I smoked an early prototype of this at the IPCPR Trade Show last year given to me by Jim Colucci, and whether it’s a tweaked blend or just time, it has improved greatly since then. Back then it was very strong and harsh. Now it’s far more balanced, and only medium- to full-bodied. It’s a good cigar, and fans of Casa Fernandez lines will certainly enjoy this one (although I do wonder if they provide slightly better value given the similarities). Still, there’s plenty to like in the Sindicato cigar, and I think it may continue to get better with time. Even in it’s current state, it earns a rating of four stogies out of five. Want to buy this cigar? Please consider purchasing from a StogieGuys.com retail sponsor! I really like Hex and Affinity, so this is worth a try. Thanks. Anyone had a Casa Bella? Corona Gorda didn’t manufacture loads of resting smoke it did have a near perfect draw and burn line. It is multifaceted, balanced, and plentifully flavorful.